Mr Sherinian who is a super keyboard player is mostly known as one of the members of Dream Theater between 1994-99, but before that he was also a member of Kiss and Alice Cooper. After the years together with DT, he started a own band called Planet X where he could experiment and create his own niche in the progressive metal, with fans from jazz to technical heavy metal. As a member of Black Country Communion with Joe Bonamassa, Glenn Hughes and Jason Bonham he became known to the wider rock audience. On this album "Oceana" he uses his co producer Simon Phillips (ex drummer of The Who, Jeff Beck, 10CC, Roxy Music, Mick Jagger, Toto, Mike Oldfield) on the drums and have Jimmy Johnson and Tony Franklin on bass. 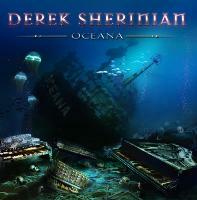 As guitars players on "Oceana" he's got Joe Bonamassa, Steve Lukather, Tony MacAlpine, Dough Aldrich and Steve Stevens. What a lineup!! This is a very advanced and a special chapter in the rock genre. "Oceana" is an entirely instrumental album and the tracks swings from a more jazzy improvisation music to harder fusion rock. Even if this is Derek's solo project, he doesn't steal the attention from the others guys, without letting them show what brilliant musicans they are. It's almost an overdose of musicality and magical riffs and keyboard solos are almost too much to handle for me. If you are a fan of advanced instrumental music with amazingly talented artists this is probably ear-candy for you.